* This article is written in both English and Japanese. Let me allow to start with a personal story concerning this book. At the beginning of 2013, I released a SID music compilation titled C64 Dub Reggae . Commencing with dubstep and brostep songs made with LSDj on the Game Boy, it seemed that the use of elements of music belonging to branches of reggae/dub was a “mark” in Japanese chip scene at that time (e.g. NNNNNNNNNN, TORIENA, MARU303, USK, ajipo, Tappy). It is true that some musicians have practiced reggae/dub before that (e.g. cow’p, shex). But it appeared that the trend was reaching a saturated state and coming crisis. Multinational labels such as metrodub showed that this phenomenon was not an unusual case limited to Japan . In the demoscene, sceners began to be interested in dubstep in the late 2000s , but in 2013, for example concerning the soundtrack of Carillon & Cyberiad’s PC demo named Spacecut which took 1st place in Assembly in this year, this kind of music was obviously used for general-interest appeal rather than a taste in underground. On the other hand, I knew that English 4-mat, German Kasmo, and others had worked with musical translation of dubstep in SID music. Bad Scene Poets Are Back (Ate Bit, 2009) by 4-mat was one of songs which gave me cause to make the SID compilation . Also, when preparing it (2012), I found an article written by Neko Massive aka Ruv Bytes, which dealt with an introduction to SID Machine which he took over from Disrupt, the owner of German netlabel Jahtari . I though it interesting that he connected to this trend clearly different from the chip scene, and associated it with the thing that their touch point with reggae/dub was not already exclusive to narrow-defined chipmusic for musicians such as Quarta 330 and utabi as well. And I couldn’t afford to ignore Hirokazu Tanaka aka Hip Tanaka who created the soundtracks of Balloon Fight and Wrecking Crew (both arcade versions began to run in 1984 and were ported to Famicom/NES in the next year) as a great pioneer of these musicians. Because he really had performed at large-scale events related to chipmusic like Blip Festival then. As seen above, even though my attempt was within Commodore 64 and SID music, it intended to highlight the parallel with other platforms or territories and a genealogy of reggae/dub through chipmusic. After the compilation was released, I unexpectedly got reactions from goto80 and Nicolas Nova, so I believed that this problematic could be shared with others to some extent . As mentioned above, it was important that this current was not only limited to the chip scene and that it didn’t necessarily fit into the common circulation of diffusion and consumption about a musical genre. “8-bit reggae” is the name and concept that Nicolas Nova calls this “current” in the book. From now on, I take a look at some notable points in his case study. 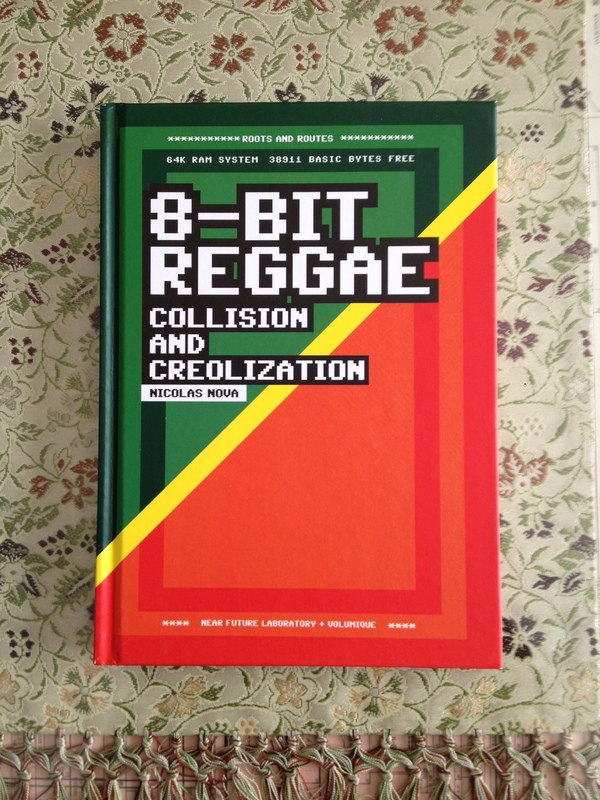 According to the author, “8-bit reggae” is “hybridization” between reggae and video game. In my opinion, this term which shows certain interaction was carefully chosen not to emphasize aspects of cultural appropriation and exploitation. As for video games, main formative foundation of this music is arcade machines, home consoles, home computers, and software titles on each hardware from the late 1970 to the 90s. The book traces the development in Part 2 (i.e. Famicom/NES, Commodore 64, Game Boy, and so on). But this term covers wider range of things. Even though “8-bit reggae” sounds very cohesive and homogeneous, I use it here as umbrella term that covers a large variety of sub-genres and types of productions: chip music (synthesized electronic music produced or emulated by the sound chips of vintage computers, video game consoles, and arcade machines), sound systems that use C64 computers to trigger weird samples, or reggae-dub bands that occasionally employ a Game Boy to generate bass lines instead of using a proper instrument. I must add that “8-bit reggae” is not necessarily the only term employed by musicians, producers and aficionados but it looks rather good and, we need a general concept anyway . The first encounter between video game and reggae is the work by Hirokazu Tanaka who was driven by musical translation of rhythm produced by Sly and Robbie for the soundtrack of Balloon Fight in the middle 80s. After that The Secret of Monkey Island episode 1 and 2 (1990/91) in the West. For Disrupt, the latter is exactly a work which prepared him for meeting reggae. We can work with reggae/dub by using part game consoles and computers at present. The results, or typical practices of chipmusic are also included in 8-bit reggae. In no small way, exoticism has played a driving power of reggae as a “travelling culture” in this way , and this attitude of challenge and playful mind exists also in 8-bit reggae. Sounds could become detached from contexts of video games, or images indivisibly united with certain video games could affect making music. The opposite is true. The historical contexts and baggage of reggae can become dim or even get lost in the process of hybridization. It seems that Nova doesn’t necessarily see the work as negative. [..] concerning the non-musical baggage of reggae, 8-bit composers seem to distance themselves from the lexical field of the genre, and from the religious content produced by Jamaicans. Reggae and Rasta slang are sometimes used in gigs and track names, but they’re more employed as a gimmick than a truly cultural reference. This might be because of the ethnicity of the musicians: most of the 8-bit reggae crowd is made of Western, and sometimes Asian, peeps whose relationship with Jamaican culture is mostly limited to music, regardless of the social and political origin of reggae . The author calls parts of these miscellaneous “cultural elements” (Zimmermann) , and the ways “bricolage” (Lévi-Strauss) . It has been rare that black cultures are radically questioned by people involved in chipmusic or MOD music. In the demoscene, although idioms such as graffiti and oldskool there don’t hide reference to hip-hop, the roots of their work are usually hidden as such. This does not mean that musicians in the chip scene and demoscene are not interested in black music at all. But in terms of their productions, there is distinct tendency of ethnicity, compared to other music genres such as hip-hop, house, and techno. I think it is precious problem presentation that the author awakens contexts which are not much dug into in the demoscene and chip scene. Amplifying his theme, we should probably reflect absolute absence of iconic black musicians like Afrika Bambaataa, Derrick May, Bob Marley, etc. as well as the ethnicity of audience in chipmusic. The brief history of chip music highlights the importance of hardware and software. In terms of musical genres, a certain number of styles were produced, mostly covers of classical music and pop/rock songs. However, as emphasized by music researchers such as Anders Carlsson, there was definitely a lack of “black music” in the chip world. There is indeed little jazz, hip-hop and soul, as opposed to pop-rock. If you listen to most of the tracks produced until the mid-1990s, the focus was rather on melody and harmony as opposed to rhythm . If “covers” here indicate so-called cover songs, this opinion may be slightly inadequate. I think that mainstream of Western chipmusic is huge numbers of original songs more than a lot of covers. Once again, the author’s concerns are reasonable. We would say that a few groups like Up Rough and Melon Dezign have played an opposed role against cultural bias seen in the demoscene productions to some extent. For my own part, I’d like to add demoscene/chipmusicians such as DRAX, Aleksi Eeben, willbe, Tempest, Abaddon, and Reed, or Russell Lieblich, a video game composer there. Immediately I must add that Nova does not present 8-bit reggae as a modern version of “White Blues” and “Blue-Eyed Soul.” He rather does a sort of geopolitical turn, employing Paul Gilroy’s theory. The dissemination of reggae/dub out of Jamaica can be seen as part of what Paul Gilroy called the “Black Atlantic”, the cultural circulation among the networks of the African Diaspora back into the Western world. Gilroy uses this image of a criss-crossed Atlantic ocean to denote a complex set of exchanges: transatlantic slavery, melodies, dreams of repatriation, drum rhythms, fear, immigration, etc. For him, the “Black Atlantic” insists on the importance of cultural recombination and circulation… which leads us to wonder about the innovative derivations and new musical traits acquired by reggae out of the Caribbean island . It seems that the author thinks closeness between reggae/dub and video game technology comes from every homology of essence, not just coincidence. What is this essence which becomes activate by transferring positively? According to philosophical terminology, 8-bit reggae is understood as a mode, not as a type of fashion. As I discuss later, musicians concerned often see through this analogy. The book is nothing but extraordinary efforts to verify this intuition historically. [..] these cultural elements were increasingly transmitted to other places, were modified in the process, and became hybridized with other cultural elements from other territories; and first of all, in the UK . 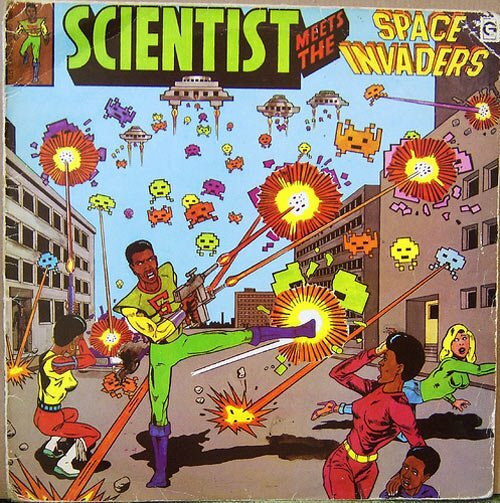 For me, I knew reggae/dub through forms modified/mutated by British musicians at first (e.g. Songs to Remember and Cupid & Psyche 85 by Scritti Politti, and Sandinista! by The Clash). Part 1 of the book which traces formation of reggae and various musical development is brilliant description can’t help but finding routes to/roots of reggae around us. Jamaican people who had been forced to move to Caribbean islands from Africa for slavery recreated African instruments from available materials at plantations. But they were not allowed to enjoy their musical activity under colonial rule, and then they were imposed on training of European music by their masters. Bricolage and hybridization had already happened here. After 1940, R&B was introduced from United States of America, and then their reception of music eventually began to mature and the invention of sound system was technically required for collective musical experience. Given the circumstances, an operator who spin records by using one turntable and his voice, a profession who was commonly-called a “selector” appeared. Just around the same time, recording studios began to be founded. And later selectors’ desire for making their own music and need for Jamaica’s own music had become increased towards independence from Britain in 1962. Thus ska, rock steady, and reggae were born. They are all musical forms with flexibility, which has survived under the condition of colonial rule at first, changing their shapes. They are divers as genres, but share common mode. Dub was also invented due to this flexibility, or fluidity. Originally, this term derives from particular record called dub plate which was used by selectors for their sound system before public release. At that time, music was recorded on two tracks: the vocal on one and the rest of the band on the other. The studio engineer would then mix the two to create the full song. Interestingly, the selector of Supreme Ruler of Sound, Rudolph “Ruddy” Redwood, accidentally discovered that this feature could be used differently. In 1967, he went to Duke Reid’s Treasure Isle studio to cut a one-off dub plate of The Paragons hit “On The Beach”. The studio engineer, Byron Smith, inadvertently stripped a song of its vocal track, and amped up the bass of the track. On listening back, Smith liked the effect of just having the bed track by itself and played it on his sound system with his toaster, Wassy. People in the dancehall became so excited that they began to sing the lyrics of the vocal track over the instrumental . As you can see, this is the pioneer work of remix activity. Also to mix songs smoothly by using faders is known as common technique among DJs around the world. It was an invention/a technology created by Jamaican legendary engineer Osbourne “King Tubby” Ruddock’s knowledge of electronics . Instruments and equipment which musicians and engineers use are different, however, their work consciously iterates the process of musical invention by Jamaican. We can call it DIY in general, but it is historical DIY which thrives on limitations with “roots and routes” (Gilroy). For example, I think that DJ MasterKOHTA (the owner of Cafe la Siesta) who I conducted an e-mail interview for the author’s research is surely a musician remains true to that vibe. Reggae and video game technology is analogous regarding its way of surviving. Even though the names of the derivations change, its transferring mode would be constant. Five different generations of chipmusic explained by Dubmood for the case study of this book is enough simple and precise about the music and goto80 also explains his process of making music with SID in a careful manner. You shouldn’t miss these notable knowledge. Editorial design by Étienne Mineur and Julie Chane-Hive is neat, so it makes the body text pop well without losing daintiness. Nicolas Nova’s 8-Bit Reggae is available at the site below. Nicolas Nova: 8-Bit Reggae: Collision and Creolization. Editions Volumiques, Paris 2014, pp.15-16. Pingback: Digital mystics: the strange story of the 8-bit reggae underground – FACT Magazine: Music News, New Music.